Grilling is supposed to be the best way to prepare food for health-conscious families out there. For one, you won’t practically need oil because it will ooze out of the meat while cooking. Aside from that, the latter will be able to retain its nutrients (e.g., thiamine and riboflavin) more than when you heat it on the stovetop. This method of cooking seems like a part of the tradition of American families. 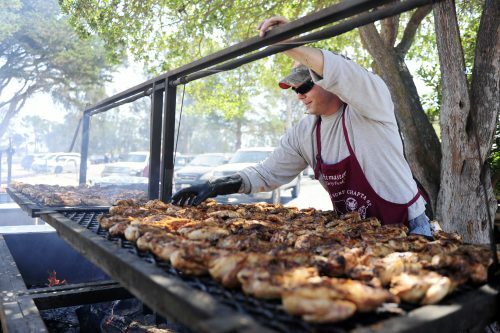 Whether it’s fourth of July, Thanksgiving, Christmas, or even Super Bowl, almost everyone brings out their griller while having fun with their loved ones. You know that you are having a perfect holiday, after all, when you can eat freshly grilled corn, meat, and vegetables instead of pan-fried or store-bought ones that may be tasty but still won’t let you live for 50 more years or so. Nevertheless, for those dads who have not mastered the art of grilling yet, you may not be aware of the fact that a griller and fire are not the only things required to produce perfectly grilled food. 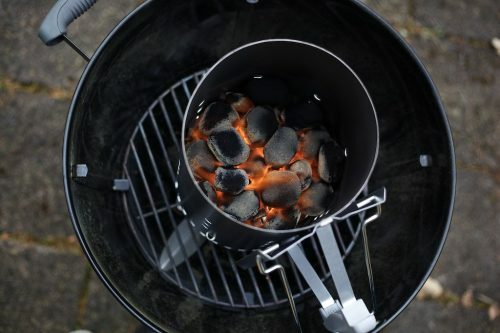 To help you fix your checklist, below are the three must-have BBQ supplies for home use. It is common for people who start bonfires to splash gasoline or any flammable liquid on wood to allow the flames to roar high and long. Because of that, some people think that it is okay to make use of similar materials when cooking outside without a stove. The truth, however, is quite far from that. You see, the smell and the taste of petrol can infuse in the food and turn it into something almost hazardous. That can be especially harmful to kids; that’s why you cannot grill with gasoline as a fire-starter. What should be using in place of that is a convection igniter, which needs paper to light the coals or dried wood. Others call it a chimney starter as well perhaps since it consists of a metal cylinder with the top and a portion of the lower half open, as well as a perforated metallic piece in the middle that will hold the coals. You may buy it from a hardware store or create your own. Having a long pair of tongs can mean heaven and earth to the consumers. 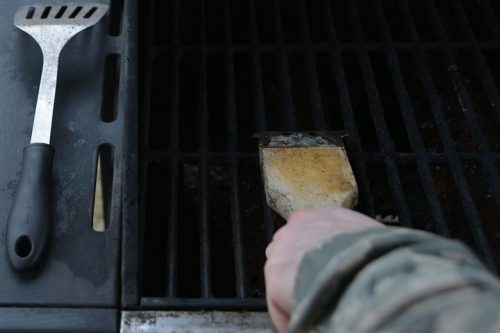 After all, it will determine how safely you can flip or take the meat out of the griller and keep your hands from touching the flames in the process. 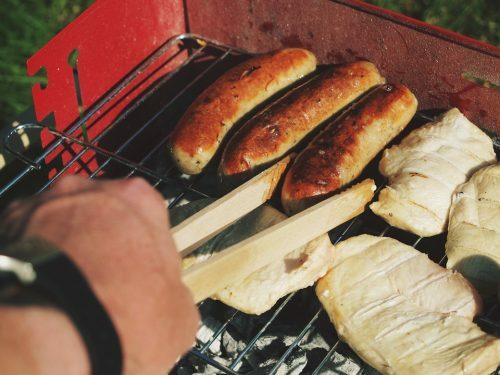 The food pieces cannot stay out in the open for a while either when they are still grilling because the wind may extinguish the fire and leave you with an uncooked dish. Thus, many grillers usually have a thick metal cover that will not let the heat escape and make the fire bigger and hotter. This level of hotness can seriously cause an injury; that’s why it is highly recommendable for you to obtain long tongs. The longer they are, the better. The base material for the said tool will vastly depend on your preferences. In case you want to be eco-friendly, you may purchase wooden tongs (as seen above). If you are looking for a product that will last, though, the stainless-steel ones may be worth buying. Are you surprised? It is not just your teeth that need a good brushing after every meal, you know – it is essential for the grid as well. There are a couple of reasons why a durable stainless steel brush is one of the essential BBQ supplies of all time. The first reason is that you ought to remove the burnt pieces from the last meat you have cooked on the grill. You don’t want them to get stuck and transfer to the new ones that you are preparing. Otherwise, you and your family might eat charred food, which is not beneficial for your health. Another reason is that the beautiful grill marks that you tend to see from restaurants will not be visible if the griller itself is not tidy. Although it is a homemade meal, it won’t hurt to have food that looks as if it was grilled to perfection by an expert. Grilling delicious food under the stars and on a sunny day is a wonderful experience that does not have to be ruined by the lack of proper tools. Check the items mentioned above off your list before hosting your family’s next BBQ party. Cheers!